Fencing, what is it, do I need one and, what kind should I get? First let me start off by quoting a definition “A fence is a freestanding structure designed to restrict or prevent movement across a boundary. It is generally distinguished from a wall by the lightness of its construction.” Most fences have a few things in common. Vertical posts are inserted in to the ground and secured every 6 to 8 feet and then horizontal fencing material is attached to the posts creating a solid structure. 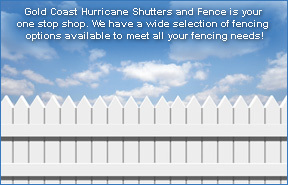 Gold Coast Hurricane Shutters and Fence is your one stop shop, we have a wide selection of fencing options available to meet all your fencing needs. Now the first question you have to ask your self is, “what kind of fence is best for me?” or, your choice is already predetermined (forced on you) by your Home Owner Association. Now there is a wide variety of choices the first being what material you want the fence made of, the most common materials used are: Wood; PVC (Plastic); Metal (Aluminum, Steel, Iron, Galvanized) and stone. Then with each material option there are several styles to choose from. We manufacture & install Decorative ornamental aluminum fences that bring an extra touch of elegance and stately accent to your home or business, improving the appearance and increase the value of your property. An aluminum fence is the perfect way to provide security and beauty to your back yard. A Deco Aluminum fence gives you a great look and the ultimate combination of strength, beauty, and durability and is always admired in the best of neighborhoods and with an aluminum fence you have freedom from maintenance. Whether it is for a swimming pool or a gate entrance decorative Aluminum is the perfect answer to your fence needs. This type of fencing is typically created from tubular bars and comes in a wide variety of styles, from contemporary to traditional. We also install it in a number of standard colors. an excellent choice for privacy fencing, whether it be in terms of noise barriers or, more commonly, visual barriers. Wood fences (along with their vinyl copy-cats) provide some of the most attractive fencing options available when your chief concern is creating a backyard sanctuary. The stockade style offers an example of a wood fence design that can afford a solid visual barrier between your yard and your neighbor's, resulting in almost total privacy. And another very popular style of wood fence is the board on board shadow box which provides privacy with some airiness to it. The main benefits of wood fencing are its beauty, privacy and longevity. Modern technology has made pressure-treated pine, a good choice for residential, commercial and agricultural applications. With proper installation (very important!) and treatment procedures, these fences will last for many years. Chain link is the best-selling fencing system in the world—and for good reason. It is perhaps the most effective yet economical fencing barrier available today. We install chain-link that is known for its strength and durability and that offer the most affordable way to protect children, control pets and protect your property and assets. PVC Fences PVC is one of the most exciting, versatile and attractive materials in fencing today. It can imitate both wood and ornamental styles and maintains its beauty for years. It is also virtually maintenance free! Choose from a number of colors including white, gray, tan, wood tones and black or green. PVC fencing is also fabricated in any architectural style. When making the choice of fencing for security purposes, you must first answer this question: How sensitive or valuable are the assets or property to be protected? The answer will determine how impervious to intruders the fencing system needs to be. We can design a system using any number of anti-climbing, anti-cutting and/or terrorism resistance features. Gates are the finishing touch on any fencing system. For the ultimate in entrances, ornamental metal gates—with optional automated entry systems--are popular installations in upscale residences, country estates, limited access neighborhoods, condominium complexes and ranches or businesses. We also install standard wood and chain-link gates. For years Owner Michael Cooper and his professional and trained staff have been providing what you need against these storms: Protection!. Our shutters also give you the protection you need against vandalism and conserve energy as well!